Weil Erwachsene die Dinger gern diskret behandeln. As an adult, you may not want to wear visible dental braces for aesthetic, personal or professional reasons. A lingual treatment procedure may be a possible solution. The fixed system is attached to the inside of the teeth, making it not only discreet but practically invisible. 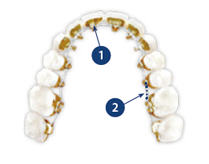 The inner bracket system is manufactured individually for each patient using a patented process. Which is why it cannot be provided by every orthodontic practice. Good to know: Our practice is specially qualified for treatments using the lingual system. Additional options include barely visible, removable braces made of transparent plastic as well as tooth-colored aesthetic ceramic brackets. Which system suits you? We can help you find out.